President Donald Trump has a long history of ditching our traditional allies and instead becoming buddy-buddy with the worst people on the world stage. He has developed cozy relationships with the murderous Kim Jong-un regime in North Korea, with Philippine leader Rodrigo Duterte who has encouraged extrajudicial killings, and of course, with Russian President Vladimir Putin—who Trump trusts more than his own government. Now, President Trump has linked arms with newly elected far-right President Bolsonaro in Brazil. President Bolsonaro has said that he would never love his son if he were to come out as gay and that he would prefer a gay son die in a car accident. He has encouraged violence against gay people, saying if he saw gay people kissing in the street he would "beat them" and that parents should beat the gay out of their children by whipping them until they are straight. In response, President Trump has designated Brazil a "major ally" and heaped praise on the new President. Worse still, in a recent press conference, President Bolsonaro announced that the United States and Brazil were united against LGBTQ+ people. In response, Donald Trump just stood silently and smirked. ENOUGH IS ENOUGH! We need to demand that President Trump stand up for Americans, NOT vicious dictators and wannabe dictators abroad. 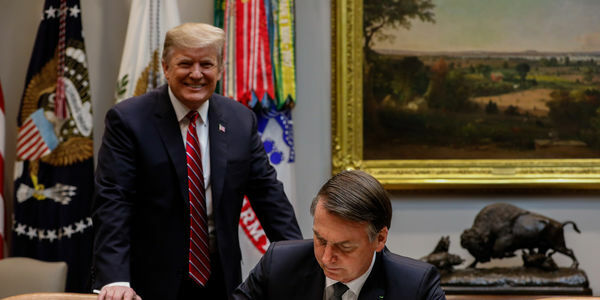 Will you stand up and sign this petition that demands President Trump CONDEMN and DISAVOW President Bolsonaro? We need you to send a message to Trump that we'll never accept him putting his totalitarian friends over the American People. Will you stand up and speak out?